Tron Legacy is a sequel to the 1982 cult movie TRON. Tron Legacy looks and sounds brilliant. The computer graphics and the ‘Grid’ landscape are amazing. After reading a lot in 3d magazines and the like, apparently the world of computer graphics were pushed to the limit with this movie. Simple scenes such as the Clu 2 character walking through the arena were completely CG, as is Sam’s suit whilst riding his light-cycle. The 3d conversion is fantastic. I tend to think that animated movies look the best in 3d (Avatar, Megamind), as the image can undergo more evasive manipulation than that of its film counter-part. The action sequences are a joy to watch. Light cycle-chases, disk battles and planes ablaze, leaving streaks of flowing, ebbing colours running along the screen like a groovy lava-lamp equalizer, moving and changing with the throb of the electro base. Such action scenes however, are done away with in the movie’s introduction, quickly running Sam through them as a recap of the original TRON, getting viewers up-to speed about what this world is, and then putting them smack into expositional plot. In this sense, Tron Legacy is less a sequel and more a deliberate marketing strategy to place the product to contemporary audiences. The world of TRON, inside the ‘lost hard-drive,’ has evolved naturally like a Galápagos Islands, away from any other computer system and, as pointed out in the script, the internet. This explains the organic and updated look of the new Tron Universe as compared with the original TRON: gone are the limiting straight lines of the light-cycles, and we even see naturally evolving mountain ranges and water! Unlike The Matrix which is designed to receive constant updates and changes like any other Windows software, The Grid was left to its own devices, welcoming the arrival of a new form of life in the Iso’s: naturally evolved organisms birthed within The Grid, free from User’s pre-programmed functions they have complete free will. The soundtrack by Daft Punk is truly awesome: digital beats are accompanied with symphony strings; a blend of traditional, textural sound with the almost sterilised perfection of computer emulation. In regards to the script, computer programming serves as a metaphor for eastern philosophy like the original TRON. There are references to gods and their creations, destiny, legacy, evolution of life and spirits within the machine. Frankenstein is played as The Dude, and he suffers the mistake of lack of a thought-out-plan – creating for the sake of creating, like the creator of Jurassic Park, not because he should but because he could. Olivia Wilde is a great new find. Comic and computer geeks have found a new object of their affection. Olivia plays her Quorra character as young, optimistic, naive and beautiful warrior: efficient in battle, but emotionally raw. Quorra is a riff on Frank Miller’s female Robin to an aging Batman in The Dark Knight Returns and The Dark Knight Strikes Again. As Batman is to Robin, Flynn is to Quorra– one who has grown bitter and weary with the world around him, but employs the assistance of a young, optimistic, energetic girl to be the eyes, ears and heart that he needs to get the job done. Unfortunately, there are numerous plot-holes, character inconsistencies, exposition and areas where the plot takes major missteps. For example, why, if this Tron universe has been evolving on its own Hard-Drive for the last 20 years, has the arena games been used as a system of control such as that seen in the MCP from the original TRON? Clu 2 was developed from within the confines of this specific environment, and hasn’t set foot outside of it at all. It could be argued that, as Clu 2 is a mirror of Flynn; that he is using Flynn’s memories and techniques to deal with control of this world. Another plot inconsistency has Flyn making the point that Clu 2 cannot physically set foot on the naturally evolved landscape of The Grid, hence his hideout set in the mountains looking over The Grid. Yet, we see Clu freely walking all over Flynn’s pad in a scene! Why didn’t he just do this a thousand computer years earlier? There is a scene where Sam gets ‘suited-up’ by computer-program ‘sirens’, basic programs designed for one thing, which is to be stored in a facilitie's walls, to come out and dress new arrivals to the gladiatorial games, at which point they return to their holding pens in the walls. However, when Flynn is out amongst the town-folk, he bumps into one of these programs as she goes about her life, complete with umbrella! If such a program has this type of free will, why not quit that horrible job! There are also numerous scenes that do not advance the story at all, instead leading to forced obstacles that the hero must overcome, (of note is the completely redundant club scene with Michael Sheen) which is frustrating as there are bigger things afoot that we would rather see him dealing with! As mentioned before, the most frustrating thing with Tron Legacy is simply the plot. It seems that star Jeff Bridges is shoe-horned into this movie, where, unfortunately, his absence may have helped progress the film’s story to a more relevant and exciting storyline, focussing on Flynn’s son Sam and the movie’s namesake; Tron. As it is, with a graphic novel direct sequel to TRON, Tron: Betrayal , which sets up the video-game Tron: Evolution that immediately precedes Tron Legacy, it is as if we are watching the third part of a trilogy, with all the fantastic plot details delivered in stilted exposition. It is like having watched Return of the Jedi, and have a character briefly recount the events of the previous 2 films to us (not withstanding the prequels). This takes away from the relationship Flyn has with Clu.2 and any sibling rivalry that may have developed between Sam and Clu.2. This approach did not do any favours to The Matrix Trilogy where the narrative bled through three films, a video game and an Anime collection, so it is odd that the makers of Tron Legacy would choose this route. 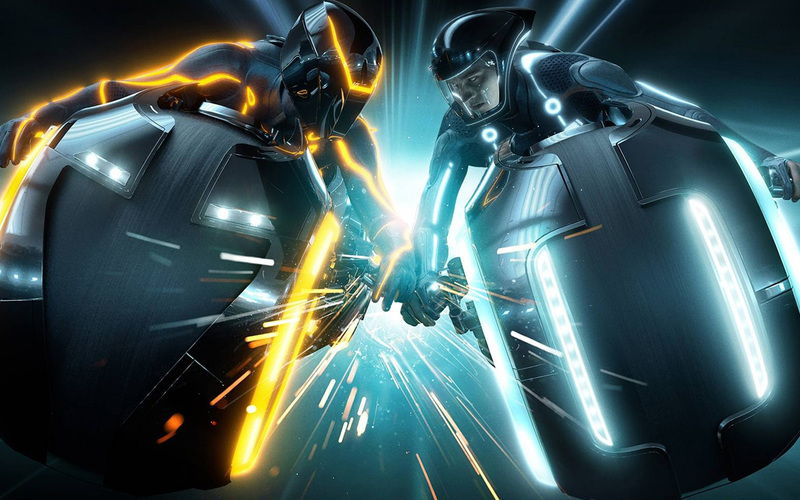 There were rumblings that Tron Legacy was in fact a bridging movie, a movie that looked to establish Tron in a contemporary setting, and then to proceed with the story; Cillian Murphy’s character as Edward Dillinger Jr, head of the software design team for Encom, was to seek revenge on behalf of his father, original TRON movie villain, Ed Dillinger portrayed by David Warner. Such hopes may have been dashed from Tron Legacy’s performance at the box-office, but that has not stopped Disney from releasing an animated television series. Tron Legacy is a sumptuous aural and visual feast. The plot is however less of a sequel and more of a bridge to something more contemporary – a passing of the torch. It is fitting that it is called legacy, however, it is a pity that such a grand story has been quickly glossed over, cinematically speaking, in anticipation of further instalments rather than delivering a hard Tron story first and foremost, the ones fans deserved.